Oort Cloud & Sol b? 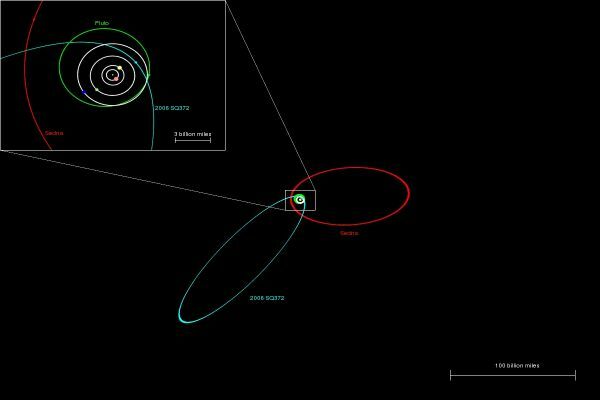 On March 26, 2014, astronomers announced the discovery of another dwarf planet in a highly eccentric orbit like Sedna. Designated 2012 VP113, the object comes no closer than 80 AUs to the Sun but ranges out as far as 452 AUs. Based on its brightness and presumed composition, it's likely to be around 280 miles (or 450 kilometers) wide (Trujillo and Sheppard, 2014). 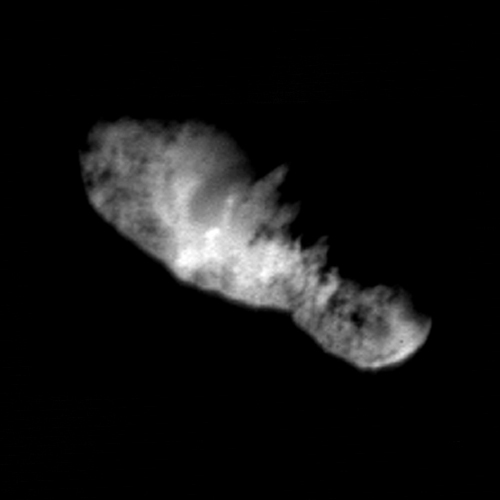 On February 14, 2011 (Valentine's Day), Comet Tempel 1 became first comet to be visited twice by Human space probes, this time by NASA's STARDUST/NExT Mission. Since a 2005 visit by NASA's Deep Impact spacecraft, the short-period comet has completed more than one complete orbit around the Sun and approached the inner Solar System as close as the orbital distance of Mars. 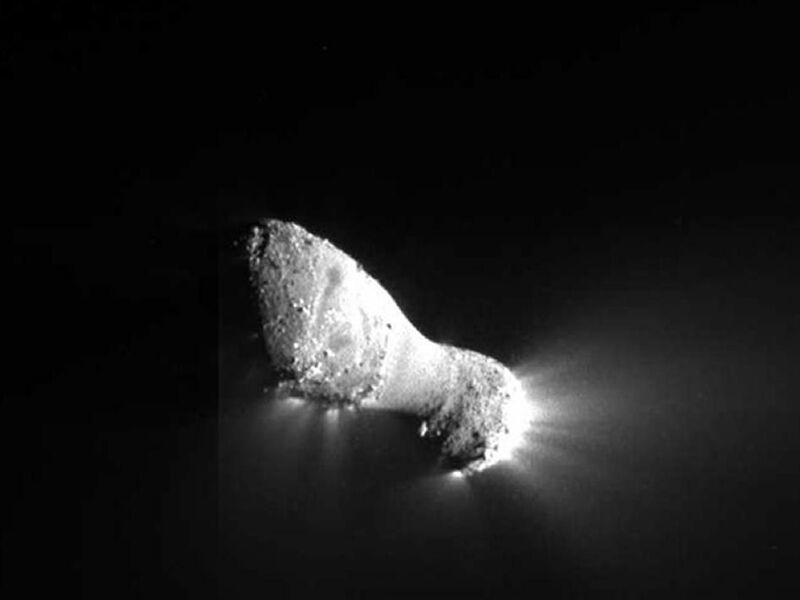 The comet appears to have undergone visible changes, including the changes in the size and number of surface features such as smooth patches, pits, and craters, and the loss of ice vaporized by the Sun or blasted off its surface by the Solar Wind into its tail as well as failing back on the object like snow, so that it appears to shrink, on average, by 25 to 50 centimeters (9.2 to 19.7 inches) with each orbit around the Sun. In addition, the collision with a 372-kilogram ( 820-pound) projectile launched by NASA's Deep Impact probe in 2005 has created a 150-meter-wide (490-foot-wide) crater with a small mound in the center, as some of the ejecta of the impact apparently fell back down within the crater, but the crater's relatively soft outline indicates that its edges have undergone significant changes since the 2005 impact (NASA/STARDUST/NExT news release; Astronomy Picture of the Day; David Shiga, New Scientist, February 15, 2011; Jonathan Amos, BBC News, February 15, 2011; and Richard A. Lovett, Nature News, February 15, 2011). In 1950, Jan Hendrik Oort (1900-1992) inferred the existence of the Oort Cloud from the physical evidence of long-period comets entering the planetary system. As Ernst Julius Öpik (1893-1985) also may have speculated about such a reservoir of cometary bodies as early as 1932 as the source of long-period comets, it is also called the "Opik-Oort Cloud." These comets are observed to come into the Solar System from all directions, which implies an immense spherical cloud of trillions of small icy, planetary objects -- all potentially active but currently dormant comets -- that extend as much as two light-years outward from Sol. In contrast, the Edgeworth-Kuiper Belt is roughly 100 times closer to Earth than this hypothesized Oort Cloud. While past estimates of the total mass of this Oort Cloud have ranged from about 40 times that of Earth to greater than that of Jupiter, observations through 2009 suggest an Oort Cloud mass of between four and 80 Earth-masses (March 11, 2010 presentation by Hal Levison on "Oort Cloud Formation - The Role of of the Sun's Birth Cluster"). from the birth of the Solar System (more). Comet Lists of the Minor Planet Center. 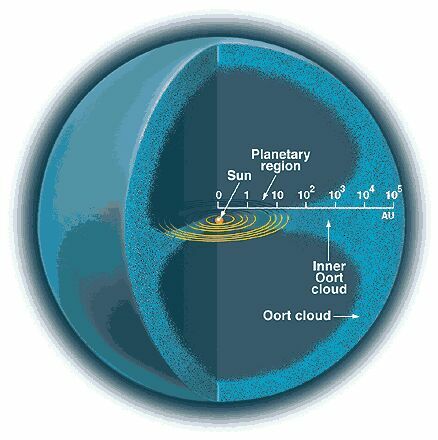 Oddly enough, Oort Cloud objects were probably formed in a region of the proto-planetary disk that was located closer to the Sun than the Edgeworth-Kuiper Belt objects that persist in the orbital plane of the planets (ecliptic) to this day. During the first 100 million years of the System's birth, small planetary bodies that formed near the developing giant planets would have been ejected from their neighorhood through gravitational encounters (Levison et al, 1999; and Dones et al, 1998). Those that did not escape completely from our Sun's gravitational pull eventually became part of the distant Oort Cloud, which became a vast repository of icy bodies tossed out of the early Solar System. 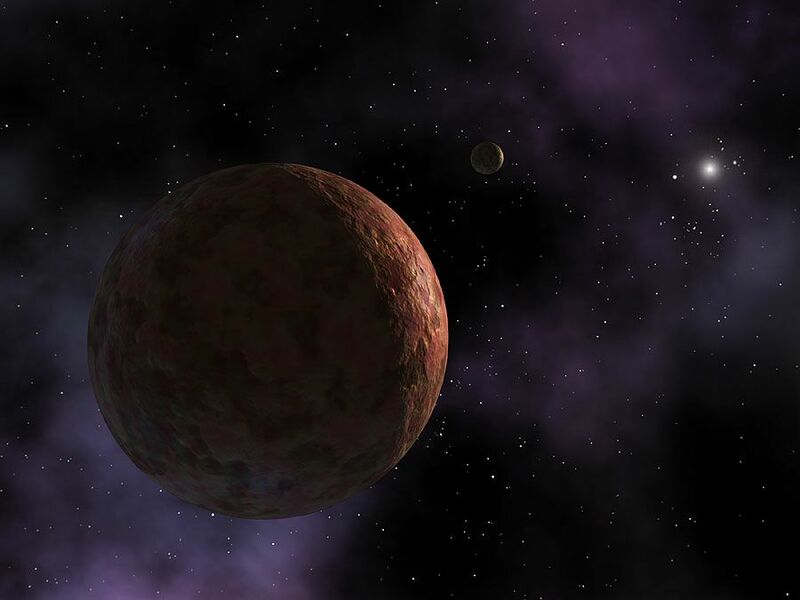 On March 15, 2004, a team of astronomers (including Mike Brown, Chad Trujillo, and David Rabinowitz) announced the discovery of a very large planetary body named Sedna in one of the most distant planetary orbits yet discovered within the Solar System. Notwithstanding its current distance of 90 AUs from the Sun -- an orbital distance that is roughly three times farther out than that of Pluto or Neptune -- Sedna will eventually move as much as 10 times farther away (around 990 AUs) in a 12,260-year orbit. Based on its current distance from the Sun, brightness, and presumed albedo or ability to reflect light, Sedna has been estimated to have more than half the diameter of Pluto and may be larger than any other planetary body found since Pluto -- initially estimated at 730 to 1,470 miles or 1,180 to 2,360 kilometers (km) across (compared to Pluto's diameter of around 1,440 miles or 2,320 km) but an August 2006 table posted by Mike Brown (a member of the discovery team) now lists a diameter of around 1,100 miles (1,800 kilometers), or more than three-fourth's Pluto's diameter. On August 24, 2006, the International Astronomical Union voted at the end of its 26th General Assembly to establish a new class of substellar objects in the Solar System called "dwarf planets", which may eventually encompass many large and relatively round celestial objects such as inner Oort Cloud member Sedna. On August 18, 2008, a team of astronomers (Andrew Becker, Nathan A. Kaib, David Weinberg, and Jordan Raddick) working with the Sloan Digital Sky Survey (SDSS) announced their discovery of another inner Oort Cloud object designated as 2006 SQ372. Much smaller than Sedna, the object estimated to be around 50 to 100 kilometers (or 30 to 60 miles) in diameter. Currently located between the orbits of Uranus and Neptune in the inner Solar System, 2006 SQ372 travels on an extremely elongated, 22,500-year orbit around the Sun, that comes within 24 AUs of Sol before moving as far out as 1,600 AUs. Simulations indicate that its orbit is transient and unstable over a period of around 200 million years (more from SDSS and Kaib et al, 2009). Recent analysis of 2006 SQ372, Sedna, and related object 2000 OO67 -- all three dynamically linked to the inner Oort Cloud -- indicate that a surface composition enriched in organic material (like the low-inclination, classical Kuiper Belt objects) may be a general characteristics of objects that stay far from the Sun (Scott S. Shepard, 2009). On November 23, 2010, NASA revealed that computer simulations run by researchers (including Hal Levison at the Southwest Research Institute (SWRI) suggest that our Sun, Sol, "stole" many long-period comets from sibling stars in its stellar nursery of birth, which may have included thousands of stars given the detection of certain heavy elements from nearby supernovae. 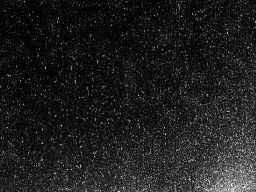 According to Levison, "comets are dregs of our own solar system's planetary formation" when the development of the planets and their gravitational interactions slinged many cometary bodies out away from the Sun for tremendous distances to create the Oort Cloud, and astronomers believe that this process created clouds of comets around all the stars around Sol's siblings born from the enormous nebula of gas and dust that gave birth to the Sun before the nursery cluster dispersed as gas was expelled by strong stellar winds and supernovae. Astronomical observations, however, now indicate that the Solar System has around 400 billion comets of a mile or two (two to three kilometers) in diameter, but the "'domestic model' of comet formation can account for a population of only about 6 billion" within Sol's Oort Cloud. Since most of these comets have very long, highly eccentric orbits that are only weakly bound to their birth star's gravity, Sol may have stolen quite a few from its less massive neighbors (NASA Science News; and Hal Levison's November 8, 2010 presentation "Oort Cloud Formation - The Role of the Sun's Birth Cluster"). Comet Borrelly's 8-km (5-mile) long nucleus (more). grains like Oort Cloud comets. 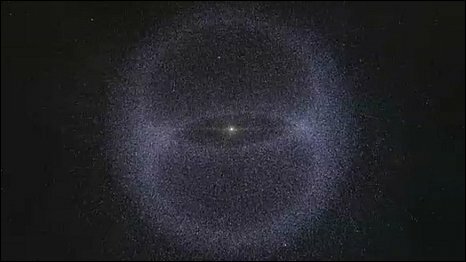 The members of the Oort Cloud are fragile and irregularly-shaped bodies of primordial material made of a mixture of non-volatile dust grains and frozen gases maintained at a typical temperature of about four degrees Celsius above absolute zero. Most lie beyond our Solar System's plane of planetary orbits, between 10,000 to 20,000 AUs outward from the Sun. However, many travel in highly elliptical orbits that bring them very close to the Sun as well as deep into space beyond the orbit of Pluto. Within the Cloud, these dormant comets are typically tens of millions of kilometers apart. They are weakly bound to the Sun, and passing stars and other forces can readily change their orbits, sending them into the inner solar system or out to interstellar space. This is especially true of comets on the outer edges of the Oort Cloud. The structure of the Cloud is believed to consist of a relatively dense core that lies near the planetary plane (ecliptic) and gradually replenishes the outer boundaries, creating a steady state. One sixth of an estimated six trillion icy objects or comets are believed to lie in the outer region, with the remainder in the relatively dense core. 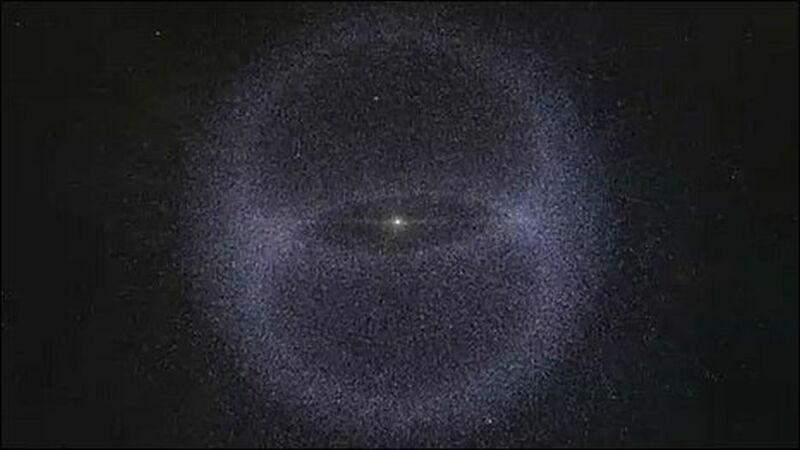 The Oort Cloud is affected by stellar perturbations where another star's Oort Cloud passes through or close by. In addition, there are the influences of giant molecular clouds of cold hydrogen and dust massing many suns and galactic tidal forces. Our Sun, Sol, encounters molecular clouds about every 300 to 500 million years, which may violently redistribute comets within the Oort cloud. 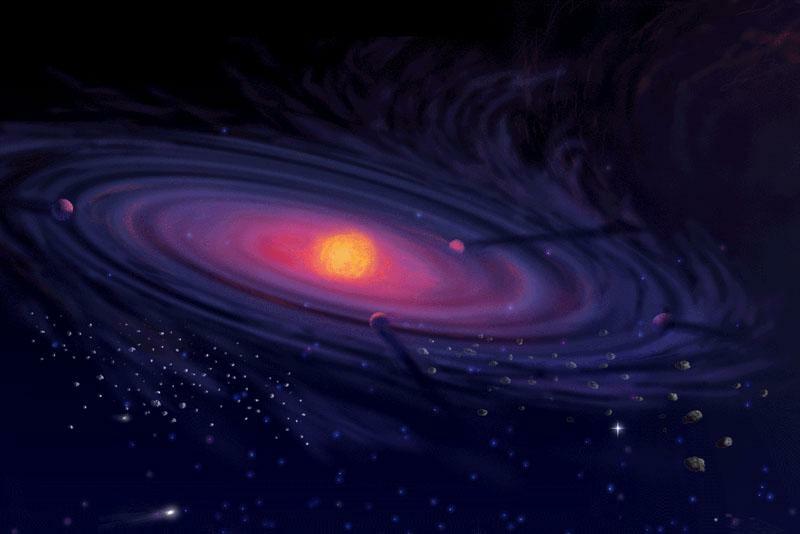 In addition, tidal forces affecting the Oort Cloud come from the differential gravitational forces exerted by stars in the Milky Way's galactic disk and by the galactic core on the Sun and comets as a result of their relative location in the Solar System, which have been modelled with numerical simulations (Duncan et al, 1987). Tidal forces have a greater impact on comets than the perturbations of passing stars, and so comets located beyond 200,000 AUs are easily lost to interstellar space. However, tidal forces also replenishes the outer Oort Cloud by pulling out inner comets. 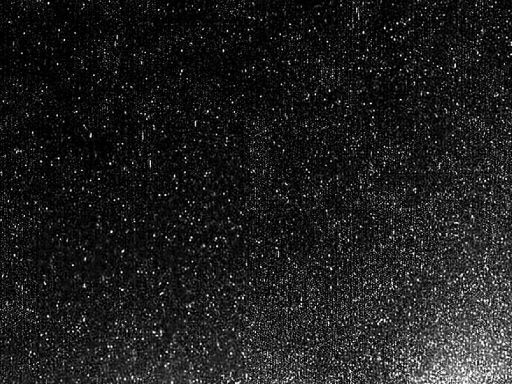 The Oort Cloud is the source of long-period comets and possibly higher-inclination intermediate comets, such as Halley and Swift-Tuttle, that were pulled into shorter period orbits by the planets. Comets can also shift their orbits due to jets of gas and dust that rocket from their icy surface as they approach the Sun. Although they get off course, comets do have initial orbits with widely different ranges, from 200 years to once every million years or more. Comets entering the region of the planets for the first time, come from an average distance of about 44,000 times the Earth-Sun distance ("astronomical unit" or AU). Comets are diverse and very dynamic, but all develop a surrounding cloud of diffuse material, called a coma, that usually grows in size and brightness as the comet approaches the Sun. Usually a small, bright nucleus (less than 10 km in diameter) is visible in the middle of the coma, but the coma and the nucleus together constitute the "head" of the comet. As comets approach the Sun they develop enormous tails of luminous material that extend for millions of kilometers from the head, away from the Sun. Orionid and eta Aquarid meteors. When far from the Sun, the nucleus is very cold and its material is frozen solid within the nucleus. In this state comets are sometimes referred to as "dirty" icebergs or snowballs, since over half of their material is ice. When a comet approaches within a few AUs of the Sun, the surface of the nucleus begins to warm, and volatile gas ices evaporate. 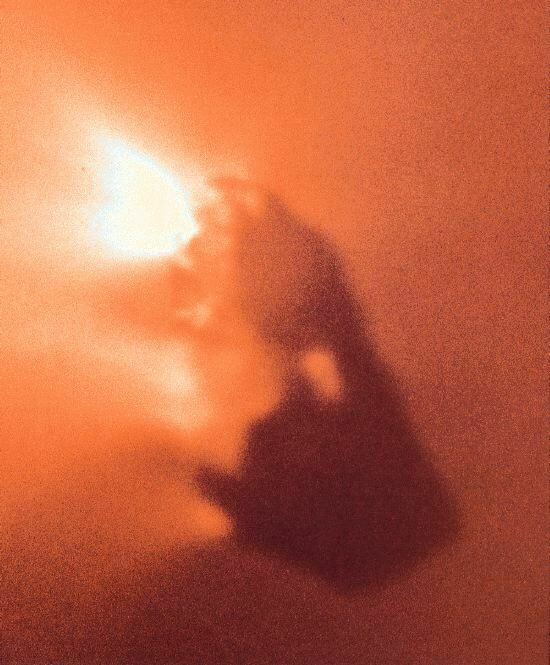 The evaporated gases boil off and carry dust particles with them, forming the comet's coma. When the nucleus is frozen, it can be seen only by reflected sunlight. However, when a coma develops, dust reflects still more sunlight, and gas in the coma absorbs ultraviolet radiation and begins to fluoresce. At about five AUs from the Sun, fluorescence usually becomes more intense than reflected light. As the comet absorbs ultraviolet light, chemical processes release hydrogen, which escapes the comet's gravity, and forms a gaseous envelope. This envelope cannot be seen from Earth because its light is absorbed by Earth's atmosphere, but it has been detected by spacecraft. (more on 1910 photo from NOAO). The Sun's radiation pressure and solar wind accelerate materials away from the comet's head at differing velocities according to the size and mass of the materials. Thus, relatively massive dust tails are accelerated slowly and tend to be curved. The ion tail is much less massive, and is accelerated so greatly that it appears as a nearly straight line extending away from the comet opposite the Sun. 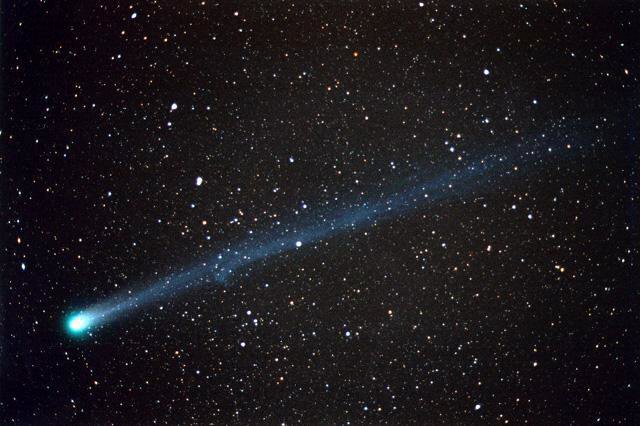 Thus, comets should have two distinct tails. The thin blue plasma tail is made up of gases and the broad white tail is made up of microscopic dust particles. EPOXI mission flyby on November 4, 2010 (more). 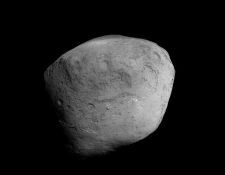 On November 18, 2010, scientists working with the NASA's High-Resolution Instrument on its EPOXI mission released images showing fluffy snowballs as large as golf to basketballs swirling around the the nucleus of Comet Hartley 2 during its November 4th flyby. 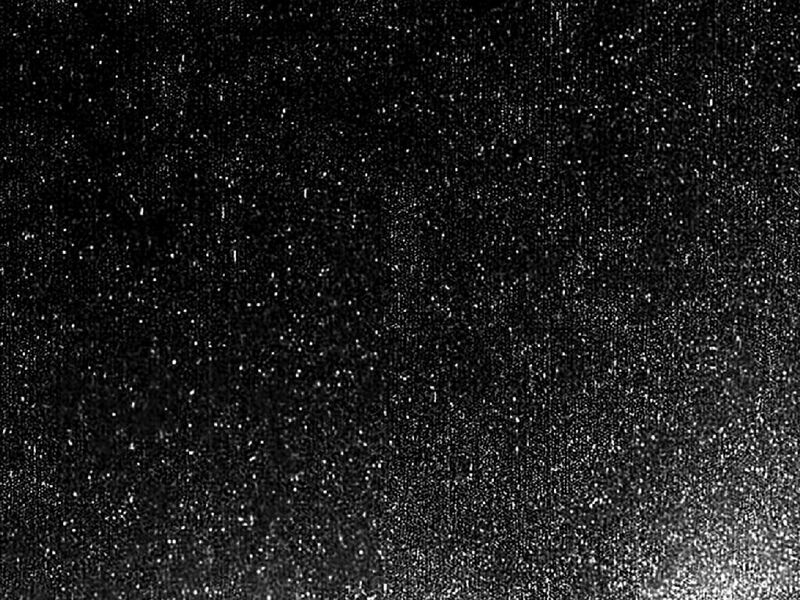 In addition to linking the comet's of dust and gas to specific features on its surface, the EPOXI mission spacecraft imaged a "cometary snow storm" created by carbon-dioxide jets spewing out tons of water as ice and fluffy snow particles from the peanut-shaped comet's rocky ends. Meanwhile, a different physical process in the comet's smooth mid-section was causing water ice to vaporize and flow through porous material to escape as a cloud of water vapor at the same time (NASA news release, and page on "fluffy snowballs;" David Shiga, New Scientist, November 18, 2010; and Astronomy Picture of the Day). On November 4, 2010, NASA's EPOXI mission flew at a close distance of around 435 miles (or 700 kilometers) by Comet Hartley 2, which was then an active short-period comet with jets of gas and dust coming off its sun-lit end and which completes an orbit in less than 6.5 years. 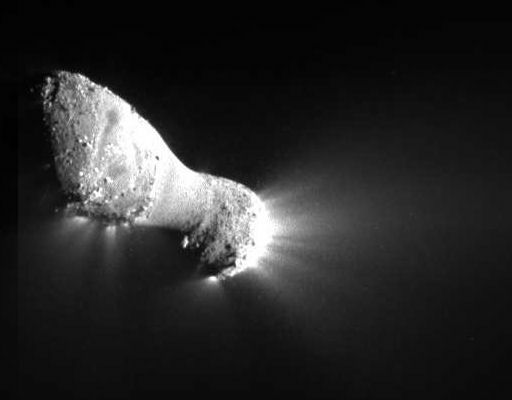 This 1.25-mile- or 2-kilometer-long, "peanut-shaped" comet nucleus was the fifth visited by Human spacecraft, which in this case was NASA's re-purposed Deep Impact probe. Deep Impact was re-routed after its 2005 visit and launch of an impactor into the surface of Comet Temple 1 (another short-period comet with a 5.5-year orbit), which created a plume of ice and dust that was analyzed for its chemical composition. In the first half of 2008, the EPOXI probe also carried out observations for its Extrasolar Planet Observations and Characterization (EPOCh) mission, which used its cameras to look for transiting exoplanets, observe the "wobbling" motions of stars with planets, and analyze the light reflected off the surfaces of far away planets (NASA press release; and Astronomy Picture of the Day). More images and information on comets are available at the Comet Page. 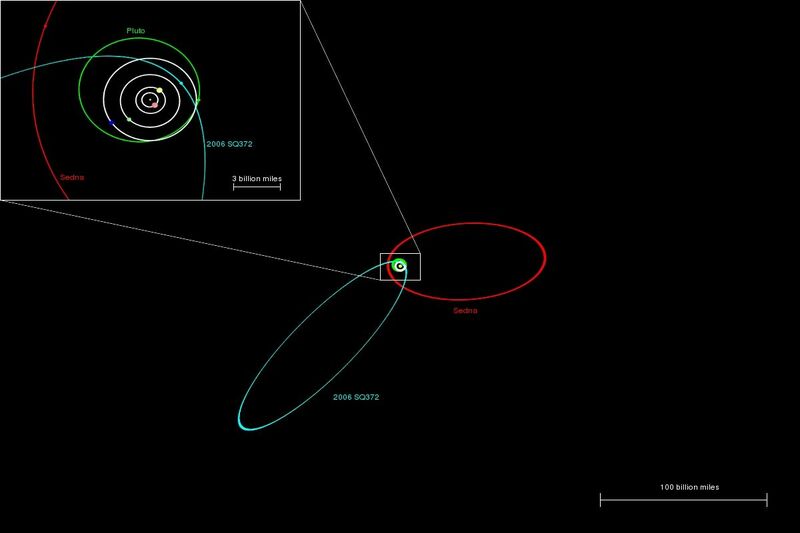 Try the Orbit Viewer, originally written by Osamu Ajiki of AstroArts and modified by Ron Baalke of NASA's Jet Propulsion Laboratory, to see real-time orbit animations of the known comets, Edgeworth-Kuiper ice bodies, asteroids, and planets. In 1999, U.K. and U.S. astronomers independently reported finding evidence that one or more large planets or brown dwarfs gravitationally bound to our Sun, Sol may be perturbing the orbits of two different groups of long-period comets at the outer reaches of the Oort Cloud into the inner Solar System with the assistance of galactic tidal forces. Calculations in 1999 by John B. Murray of the United Kingdom focus on a smaller region centered around Constellation Delphinus at an estimated distance of 32,000 AUs (John B. Murray, 1999). The U.S. team (led by John J. Matese) most recently estimated that the substellar object (proposed to be named Tyche, the sister of Nemesis) may have a mass around one to four Jupiter-masses in the innermost region of the outer Oort Cloud, possibly orbiting Sol at around 10,000 to 30,000 AUs depending on its actual mass (Matese et al, 2010; and Lisa Grossman, Wired Science, November 29, 2010). 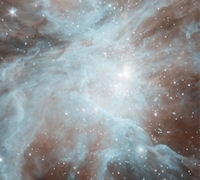 While some astronomers have speculated that Matese and Murray are being misled by random statistical fluctuations or the past gravitational effects of passing stars, Matese believes that confirmation through direct observation can be achieved by NASA with its Wide-field Infrared Survey Explorer (WISE) satellite. On May 25, 2011, at the 218th American Astronomical Society Meeting, Ned (Edward L.) Wright, principal investigator of the WISE Mission, noted that Tyche might be detectable as a "possible low-mass brown [dwarf]" in observational data already collected by WISE (now being processed) if it has at least two Jupiter-masses (AAS presentation abstract by Lissauer et al, 2011; and John Matson, blog at Scientific American, May 27, 2011). (Artwork by Linda Huff for Martin et al, 1997; used with permission). The hypothesized object appears to have a mass smaller than one controversial definition for brown dwarfs specifying a minimum mass of at least 13 Jupiters (so that deutrium fusion can be sustained). According to Matese, the objects current location in the outer Oort Cloud suggests that it did not form in Sol's proto-planetary disk. Hence, either the object formed independently from fragmentation of the original Solar nebula, or the object was ejected from another star system and subsequently captured by the Sun (possibly as early as Sol was born in the crowded environs of its original star-forming cluster). 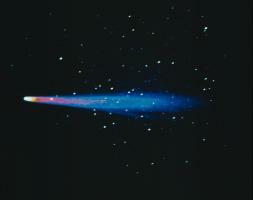 David C. Hewitt has collected more images and information on comets at his Comet Page. More images of comets are available at NASA's Planetary Photojournal. 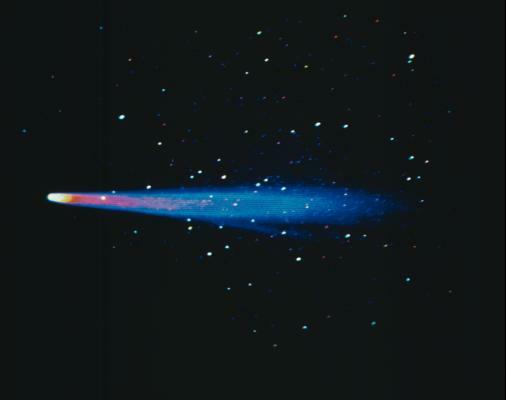 A fact sheet on many comets is also available from NASA's National Space Science Data Center. For more information about the Solar System, go to William A. Arnett's website on "The Nine Planets", or to Calvin J. Hamilton's web page on "The Oort Cloud". © 1998-2014 Sol Company. All Rights Reserved.